What happened as Hurricane Katrina made landfall in New Orleans and along the Gulf Coast on August 29, 2005 continues to seem surreal and unbelievable. Except to those residents who’s lives were changed by the breaks of the weakened levees, the subsequent flooding and complete devastation of the Lower Ninth Ward, St. Bernard Parish, Lakeview and many of New Orleans’ other neighborhoods. Within hours after the hurricane had passed through, as it seems to be with any significant news story these days, there was the flood of photographers, both still and video, recording the chaos and devastation with various motivations and intentions, including print journalism, the Internet as well as documentary. Who knows how many photographs were made. After the water had receded months later and even to this day, for $35, Gray Line Tours offered Hurricane Katrina tours so that anyone interested could join the ranks of other photographers in making their own Hurricane Katrina photograph. 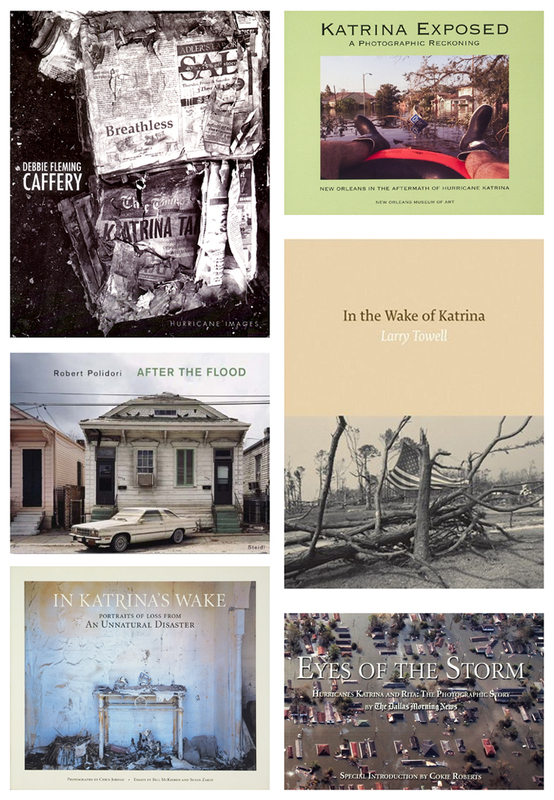 There have been a number of photographic projects on the immediate aftermath of Hurricane Katrina that have gone on to become gallery/museum exhibitions and books, including Debbie Fleming Caffery, Chris Jordan, Robert Polidori, Larry Towell, and Katherine Wolkoff. There are also collections of photographs by Magnum Photos photographers (Christopher Anderson, Thomas Dworzak, and Paolo Pellegrin), the staff photographers of the Dallas Morning News for Eyes of the Storm and the work of 173 photographers in Katrina Exposed – A Photographic Reckoning for the New Orleans Museum of Art . Many of the photographs show either a ravaged landscape predominantly devoid of people or the desperation of people trying to cope. Abandoned houses and interiors. Cars scattered around on rooftops and in trees. Photographic evidence of personal belongings after the scene of the tragedy. I hope everyone will remember the sad images taken by my colleagues of people being stranded on roof tops and freeways, for days with no food and water and remember these as symbols of the impotency of our government during a national disaster. Each morning I say a prayer of thanks that the media was there to show the world the truth. from The Aftermath of Katrina by Debbie Fleming Caffery. 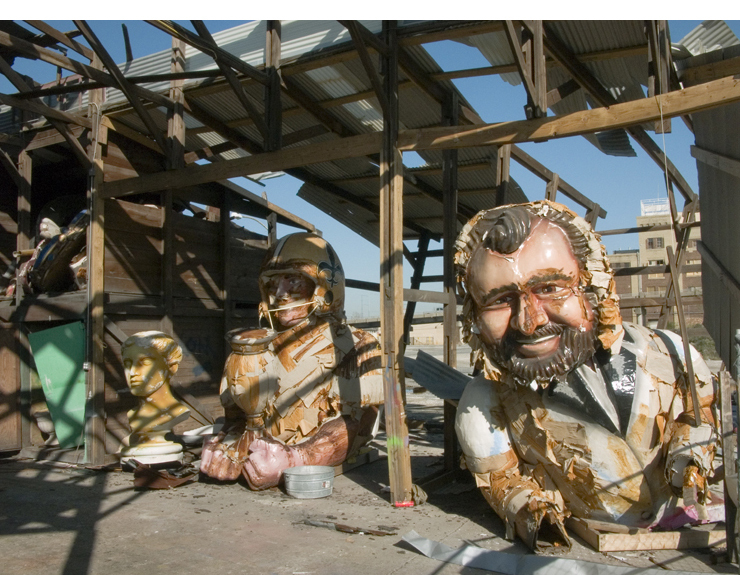 In 2006, Caffery (a native of Lafayette, Louisiana) received an Open Society Institute grant from the Soros Foundation to document the journey of displaced residents transferred from the Convention Center and Superdome to the Baton Rouge River Shelter, the destruction and neglect of the Ninth Ward, and personal items left behind in now abandoned houses and churches. As I explored miles upon miles of appalling devastation left by Hurricane Katrina, I found myself sifting through complex feelings of grief and guilt, both for the individual victims and for the loss we have suffered as a nation. Like a suicide in the family, or a friend’s drug overdose, this tragedy marks the need for some open talk around the dinner table. Putting this book together is my own way of speaking up. I hope the perspectives offered here might combine in a way that invites contemplation into the dark causes and consequences of the Katrina disaster, not as an exercise in contrition or shame but as a doorway to self-reflection. Preface from In Katrina’s Wake – Portraits of Loss from an Unnatural Disaster by Chris Jordan. With the publication of the non-profit book, Jordan made the commitment to donate 100% of his proceeds to Gulf Coast hurricane relief charities. Having lived in New Orleans as a teenager, I felt compelled to return to the city to bear witness to the stunning scope of the crisis and to ensure that the city and its citizens will not be forgotten. My photographs of New Orleans’s flooded homes reduced to rotting debris speak to the personal and collective loss suffered by the local population. The purpose of the book is to try to give some reflection to all the individual lives that have been irrevocably changed by this. I have no shame, I don’t think it is wrong to do this. I simply trying to make something visible the thing and the image of the thing is not the same thing. Is that in contradiction to the fact that I’m trying to reveal some truth? I don’t know. At the same time, I’m trying to learn what is there for me. Photography is a process of revelation. I want truth to be revealed to me and to us. That’s why I do it. from the exhibition, New Orleans after the Flood: Photographs by Robert Polidori at The Metropolitan Museum of Art and Robert Polidori podcast.mp3. After the Flood review by John Updike from the New York Review of Books. In a time where significant news events take on a life of their own, we are flooded with imagery of these moments, such as Hurricane Katrina, within the various contexts of our visual culture. Now, years later, how do these photographs function and what purpose do they serve? With so many photographs produced, what is the effect of this production, whether it be awareness, “showing some truth” or “inviting contemplation?” Or, does this over-saturation of imagery desensitize society and thus render it ineffective? Discuss whether these types of photographs will be remembered or will they fade away with the next wave of photographs from a significant event?